On the (Ferragamo) heels of JPMorgan Chase CEO Jamie Dimon's and Morgan Stanley CEO James Gorman's visits to earthquake-ravaged Japan, Bank of America CEO Brian Moynihan is now in the country to speak to his Far Eastern troops, thanking them for their efforts during these dire times and preparing them for what is shaping up to be a very busy next couple of years. Since the 9.0-magnitude quake hit Japan, some banks (Goldman) have been encouraging employees to stay in Tokyo despite risks of radiation. These banks (Goldman) and others have also been continually meeting with employees to keep them informed of any potential risks. In fact, one bank (Goldman) "has hosted three nuclear specialists and held sessions on emergency preparedness and family welfare." The reason why banks (Goldman) want their employees to feel loved and thus stay in Tokyo is because Japan's economy (the world's third largest) was on the rise before the quake and thus, once this little tragic blip is behind it, the country will be back to business as u$ual. In addition, in the wake of the quake, there should be tons of opportunities to capitalize (banks' favorite word, right behind bonus) -- that is, with tons of buildings and businesses decimated due to the natural disaster, there will be much rebuilding needed, and thus much financing needed, for the rebuliding in the coming years. Already, in anticipation of the opportunity, Nomura has announced that it will hire 600 college graduates next year to work in Japan (the same amount it hired this year). 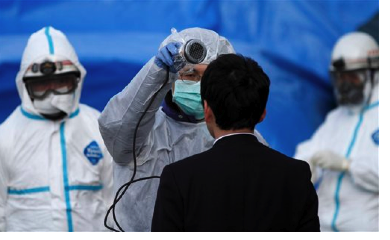 Given that radiation levels are not a risk, it would actually be a great time to work in Japan, giving wouldbe bankers a close look at what it takes to rebuild a country devasted by disaster.